Few trays are as exquisitely beautiful or in such exceptionally fine condition as this one. 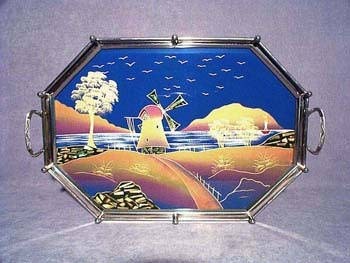 This stunning octagonal tray has a reverse painted glass bottom. The hand-painted scene is done in metallics, with the exception of the beautiful blue of the sky and water. Abalone is inlaid on the base and blades of the windmill and the other three black areas. There is no rust or wear to the chrome plating of the metal rail frame or handles. The back of this extraordinary tray is beveled wood which is held in place with tiny screws and stamped "Made in Germany". From handle to handle it measures 20-1/4".